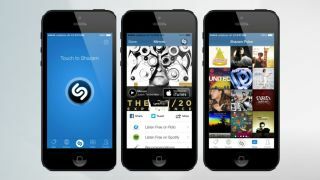 Apple has plans to bake Shazam's music-recognition service directly into iOS 8, an interesting new report claims. The plan is to incorporate Shazam into the software in the same way that Facebook and Twitter are, and to allow users to ask Siri what song is playing without opening the Shazam app. Shazam declined to comment on the matter to TechRadar, however WWDC 2014 is just around the corner and it's possible we could see the new feature included in iOS 8 when it's revealed. It's unclear right now whether Apple plans to offer up a new first-party app for all this music recognition data. The information comes from sources speaking to Bloomberg, one of which also claimed that Apple's iTunes Radio is currently gearing up for a global release. It was also reported that Apple is chewing over the idea of putting out iTunes Radio as a standalone app, rather than as just a feature built into the iTunes store as it currently stands.